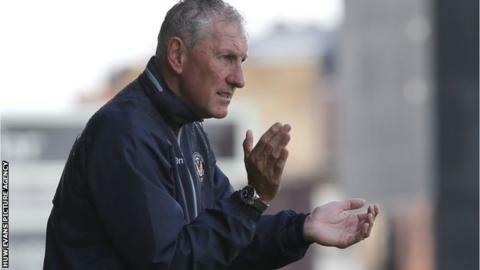 Manager Terry Butcher says his Newport County side are ready for the challenge of a new season after a testing time for the League Two club. He embarks on his first campaign at the helm at Cambridge United on Saturday. Butcher dismantled his squad because of a slashed budget and with the club in the throes of a fans' takeover. "We've had a massive upheaval, the upheaval might still continue at the top, rather than where we are," Butcher said. "The club is still evolving into something else - it is like a snake shedding its skin. "We will see what comes out at the other side - whether its a cobra, anaconda or a grass snake I don't know, we'll see what it is." Butcher has appointed midfielder Mark Byrne - one of the remaining players from last season's play-off chase - as captain of an almost entirely new side. The former England captain would still like to boost his resources before the transfer window closes, while the club continue to negotiate a new contract with promising Welsh prospect Regan Poole. Though some bookmakers are predicting a season of struggle for County, Butcher is pleased with what he has seen in the build-up to the new campaign. "I did say when I came here, every team wants to do better than the previous season," he said. "We know that might be a bit difficult because of the changes in the squad, but who knows? We could even better it. "I don't know how good this team is going to be. I don't know where this team is going to finish because you look at what we have, there is some great talent in there and some great athletes." County will be missing Matt Taylor with an ankle problem, while fellow defender Andrew Hughes is some way off from a recovery from injury. But on Thursday the club signed Wolves defender Aaron Hayden on loan for a month as cover.